PayPal president David Marcus is a blogger. Who knew? In one post he published on May 21, he reported on a recent survey his company had conducted, and he went on to say something startling: "...what people want most of all is to lose their wallets." It seems more likely that many respondents would like him to lose his wallet -- always providing they're the one to find it. Of course, Mr. Marcus wasn't reporting on a new, widespread madness afflicting the five territories (the U.S., U.K., Canada, Germany and Australia) in which the poll had been conducted. It wasn't that consumers wanted to lose their wallets in the sense of misplacing them; 86 percent of Americans said they wanted to be able to leave their wallets at home when they went out. Many of the situations in which respondents to PayPal's survey found traditional wallets unsatisfactory were ones in which PayPal offers high-tech alternatives. For example, the 19 percent of Americans who hate finding change for parking meters could instead use the company's ParkMobile app. And its person-to-person transfer service might stop you getting stiffed with the bill in a restaurant or bar. Apparently, Australians are the most likely to be stiffed with a restaurant check (57 percent), while the Brits are the least likely. However, the latter are most likely to find themselves landed with the bill in a pub. Meanwhile, it's Canadians who most wish they could visit a bar without a wallet, something many might assume to be a near-universal condition. What consumers are really saying is that they'd rather not be burdened with the responsibility of a wallet in that environment. Other places respondents say they'd prefer to be wallet-free include beaches, gyms, concerts and sporting events. That makes sense, although it raises a question: If you place your ability to make payments in a smartphone, aren't you likely to be at least as worried about losing that -- what with it also being your phone, your address book, your calendar, and so on -- as you are your existing wallet? Hmmm. PayPal is certainly working hard to fill what it perceives as a gap in the wallet-free market. Last year, it did a deal with Discover that gave it access to that company's payment-processing presence in 7 million brick-and-mortar outlets in the U.S. And, starting in June 2013, it's offering American merchants a deal whereby they can trade-in existing registers for whizzy new ones that accept credit cards, debit cards, checks and PayPal payments. As an incentive, the company is promising to waive merchants' "interchange fees" (the cut of the transaction value taken by payment networks and card issuers every time a card is swiped) for the rest of the year. You can see how seriously PayPal is taking new payment technologies, and why, in a statement, David Marcus observed: "PayPal is at the forefront of developing products that make life easier, help shoppers be more efficient, and untether consumers from their wallets forever." Back on his May 21st blog, he wrote, "The consumer sentiment this new survey shows is more proof that we're truly on the cusp of a transformational moment with regards to how consumers will make every day [sic] financial transactions." Mr. Marcus makes the big bucks for a reason, so he may be right. However, when we last tackled the topic of mobile wallets, back in February, we quoted a study from the Carlisle & Gallagher Consulting Group that found 52 percent of consumer respondents were "traditionalists," meaning they had little interest in switching from a conventional to a digital wallet. And, on the same day Mr. Marcus was publishing his blog, another firm of independent researchers, IHL Group, warned that the majority of merchants are not getting caught up in the "hype" surrounding mobile-payment technologies. It found that only 28 percent of North American retailers currently have plans to adopt mobile point-of-sale (POS) systems by the end of this year. Is that, in Mr. Marcus's words, "the cusp of a transformational moment?" It may yet be. We saw American consumers resist cell-phone technologies for years after other countries had widely adopted them, only to suddenly and wholeheartedly embrace them. Perhaps wallets, and the credit cards they contain, could all but disappear over the next few years. Of course, the plastic might disappear, but the companies behind them would almost certainly continue to provide the credit. Rewards credit cards at risk? What would be the implications, were that to be the case? That largely depends on what happens to the major payment networks: American Express, Discover, MasterCard and Visa. They're all working hard to maintain their stranglehold over transaction processing by competing in the mobile-wallet market. But, if others gain a foothold, especially if they undercut those big players with lower interchange fees, then credit card offers could change forever. Without the revenues those fees bring in, banks could struggle to maintain the attractiveness of rewards credit cards, balance transfer deals and sign-up bonuses. 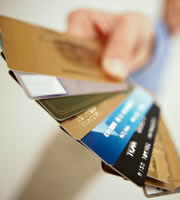 It's even possible that credit card rates could rise, or annual fees could become more common. How likely is that? Right now, it's anyone's guess. 0 Responses to "PayPal boss: You want to lose your wallet"